Beer companies have a long history of sports sponsorship. Beer remains a fixture within the top ten spending categories across the sponsorship industry. Major deals exist across high profile sporting properties such as the Football, Basketball and Rugby World Cups, which are synonymous with hospitality and fan engagement programmes. But one beer brand used the 2018 Winter Olympic Games as a platform to showcase another activation strategy. Like many of the athletes in the aerial events, Erdinger tried something different and managed to grab the attention of sports fans all over the world. How..? By claiming beer was beneficial for performance. Linking beer with elite performance is brave, but it enabled Erdinger to create cut through that many of its peers have failed to do. Indeed, back in 2016 Hans Erik Tuijt, Head of Global Sponsorship at Heineken described the Olympic sponsorship programme as “too cluttered, making it hard for the biggest sponsors to stand out from smaller ones”. So how did Erdinger manage to become the talk of the Games with articles published across the globe about beers performance enhancing properties? Firstly, the beer they are linking to a performance advantage is non-alcoholic. Secondly, they created a performance link by supplying the joint table-topping German team with gallons of it, thirdly and most importantly, they have some scientific research which shows they might just be onto something. The impact of alcohol, particularly on delaying muscle recovery after exercise is well documented. It can also impact on the cardiovascular system and inhibit a number of other post-exercise processes associated with fitness gains. This means if you are training for any major activity, including the Olympic Games, the traditional couple of pints after a session isn’t ideal. Erdinger has tried to create a position across active sport for a number of years. They have a presence spanning running, triathlon, cycling and biathlon all over the world. They target an active, health-conscious audience who want to enjoy the taste of beer without worrying about the impact of alcohol on their training. But their latest activity has taken this message one step further to claim that non-alcoholic beer can actually provide a performance advantage. In a well-developed study lead by Dr Scherr, who is also the doctor for the German ski team, a team of German researchers put the beer to the test. They took a large group of runners and asked them to drink a litre of non-alcoholic beer each day for 3 weeks prior, during and 2 weeks post the Munich marathon. The results showed that those drinking the beer had less post-race inflammation and suffered fewer coughs and colds when compared to the control group. Anyone who has taken part in a major endurance event will know that coughs and colds are par for the course. Indeed, research shows that elite athletes suffer from more ‘upper respiratory tract infections’ than normal members of the population. So, anything that helps reduce the impact of illness and supports improved recovery is surely good for athletic performance. But what is the beer doing to produce this effect? The authors conclude it’s due to the organic properties within ingredients such as barley and hops. These ingredients contain polyphenolic compounds, similar to those found in vegetables and fruit and are associated with antioxidant, anti-inflammatory and antipathogenic properties. But don’t go swapping your recovery drink for a pint just yet. During the study, the runners were all required to adhere to a restricted diet, which was necessary to ascertain any direct impact from the beer. 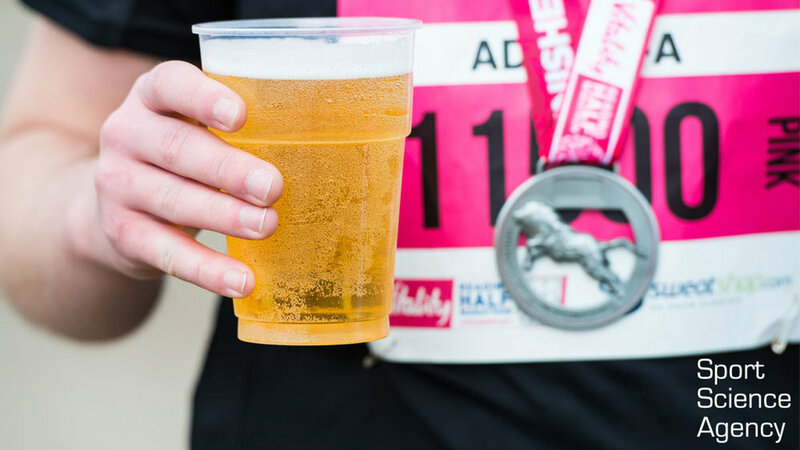 The question remains, would the beer have had any significant effect if runners were enjoying a normal balanced diet with vegetables, fruit and other sources of antioxidants? As this research is yet to be done, for now, enjoy your training, enjoy a balanced diet and you can even enjoy a few pints of Erdinger without worrying about the negative effects on your training and recovery.